The collier SS Bulli, which took coal from the Bulli Colliery to ports all over the world. View of Deal Island from the Erith Island coastline, Bass Strait. The masts of the submerged wreck of the ship SS Bulli can be seen extending out of the water in midstream. 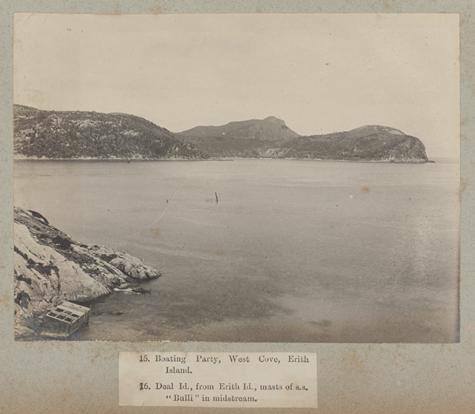 Photograph taken by Archibald J. Campbell during a scientific expedition by the Field Naturalists Club of Victoria to the Kent Group of islands, Bass Strait, in 1890. — at Bass Straight. THE steamship Bulli was built by the firm of Lewis and Stackwell at Greenwich, England, in 1872. The steel hulled vessel measured 180´ x 23.2´ x 15.9´ and was 486.77 tons gross and 337.06 tons net. The Bulli was first registered in January 1873 at Sydney to the Bulli Coal Mining Company and was a regular visit to the jetty at Sandon Point. 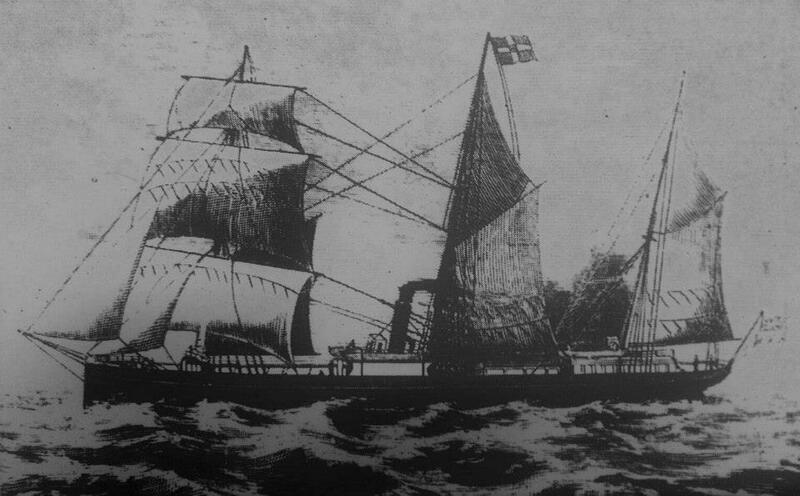 The Bulli was proceeding with a cargo of coal from Newcastle to Launceston in June 1877 when heavy southerly gales forced Captain Randell to shelter at Erith Island in Bass Straight. At around midnight on June 28 while rounding Erith Island, the Bulli struck a submerged rock and began to leak heavily at the bow. The steamship reached West Cove where the crew attempted to throw the cargo overboard, but despite their efforts the vessel foundered when the forward bulkhead failed. The 27 crew abandoned the Bulli and found safety at the nearby Deal Island lighthouse. In 1890 the masts of the submerged wreck of the ship SS Bulli could be seen extending out of the water in midstream. The ship was photographed by Archibald J. Campbell during a scientific expedition by the Field Naturalists Club of Victoria to the Kent Group of islands, Bass Strait, in 1890. Although it is located in an isolated part of Bass Strait, the condition of the wreck and the sheltered nature of the site makes this one of the most attractive and interesting dives in Tasmanian waters. At the northern end of West Cove the Bulli lies with its stern to the northeast in 16 metres of water and the bow to the southwest in 13 metres of water. In 1989 the wreck was reported to be remarkably intact and stands up to 5 metres off the flat sandy sea floor, being visible from the surface on clear days. 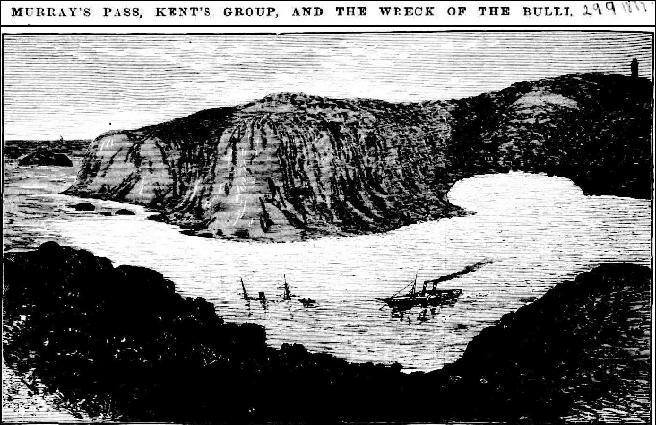 The Australasian Sketcher with Pen and Pencil (Melbourne) Saturday 29 September 1877: MURRAY’S PASS, KENT’S GROUP, AND THE WRECK OF THE BULLI.